There is a risk of her sudden death. Arrangements for the release of Ukrainian pilot and MP Nadiya Savchenko have been cancelled, her sister Vira Savchenko has said. "While 'politicians' are forming a 'coalition', the agreements about the core European value - that of the human life - have been thwarted! Poroshenko, Putin return Nadiya to us!" Vira Savchenko wrote on her Facebook page on Monday, 11 April. In the comments to Interfax-Ukraine, she said, quoting her own sources, that the arrangements for the release of her sister from a Russian prison had been disrupted. 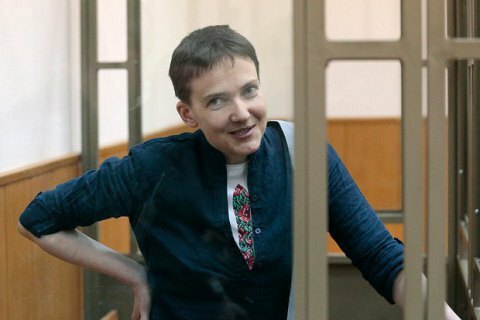 She accused Ukrainian politicians of trying to use the current situation to gain more popularity instead of taking real steps for her release. "Because the first thing that needs to be done is to bring the person home, and then they can promote themselves. Bring her back and then you can show off and take selfies," Vira Savchenko said. Nadiya Savchenko's lawyer Nikolay Polozov said on Facebook that he had visited her client in the remand centre. "She is slim and has dark shadows under her eyes. She weighs a little less than 60 kg. She says she looked even worse yesterday. On Friday [8 April] she allowed the blood tests to be taken. In Nadiya's words, there is a four-time increase in thickening elements in her bloods and a double decrease in thinning elements. Doctors told her her blood is now like resin, making it very difficult for the heart to pump it and there is a great chance of a clot and sudden death, literally in her sleep," he said. She refused to be admitted to hospital. However she agreed to glucose and sodium chloride IV drips. This morning she allegedly agreed to regular examinations, according to the Russian Federal Penitentiary Service. She went on a dry hunger strike on 6 April after the verdict sentencing her to 22 years in a Russian prison took effect.